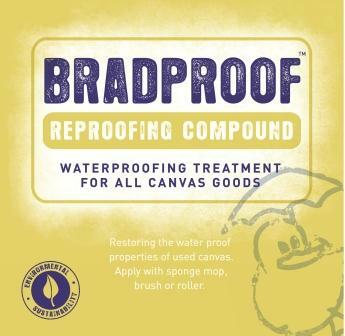 BradProof® is a water-based treatment that will restore a water repellent finish and inhibit mildew growth on used canvas goods. DO NOT APPLY TO NEW CANVAS – it is unnecessary and may lead to impairment of appearance. *This product has been formulated to improve water repellency and inhibit mildew growth, however, we cannot accept any responsibility for results obtained as both the pretreatment conditions and the method of application are beyond our control.